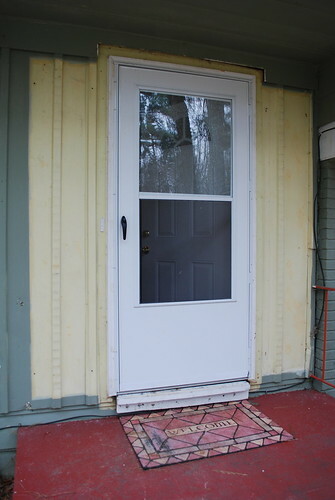 One project that really needs to be done is touching up the paint around our front door! I went to Home Depot and found a color that was pretty close. I’d like to check out Lowe’s, as well, to see if they have the exact match. I’ve been doing some research about painting the exterior of a house. I thought this article was very helpful. The most important right now is to watch the weather and find the perfect warmth and non-rainy time. I’ll update with some “after” pictures when I finish!! new name for this blog? Pingback: This Old House » Blog Archive » landscaping! If you can bring in a sample of the paint, Lowe’s can color match it. Maybe there’s a little splintered piece of wood or something that has broken off? When we replaced our gutters a few years ago, we had some rotted pieces of wood that had to be replaced. Steven brought a piece of wood into Lowe’s and they color matched it. (Because the paint was a bit faded after a few years.) You really can’t tell what’s new and what’s old paint! Pingback: This Old House » Blog Archive » it’s a gorgeous day for painting!